By the nature of the liquid ring pump the air being discharged is at 100% humidity but also carrying a lot of entrained liquid. 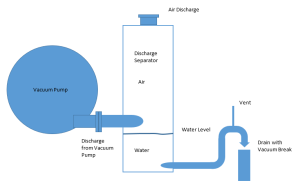 The liquid and gas being discharged from the vacuum pump are usually separated in a device called a discharge separator. This discussion is about the discharge separator for applications where water is the working fluid and the gas is not hazardous. If you are pumping chlorine and using sulfuric acid as a sealing fluid, please come to us to design the pump and separation system. However, if you are like most paper mills, you are pumping air and using water and there may be money to be saved. You may also save yourself a costly failure by following the design below. In most paper machine applications the vacuum pump is gathering air at a pressure below atmospheric, compressing the air and discharging it at atmospheric pressure. At least, that is the design assumption. If there is any resistance to the air being discharged the vacuum pump has to work harder and the cost is increased horsepower and decreased air flow. For our largest pump, the SV5986, the horsepower increase is 2 horsepower per inch of water back pressure at the pump discharge, or $700 per year for those of us paying $350 per year per HP. I have seen installations 20 inches of water backpressure so they are paying $14,000 per year for a poor design. 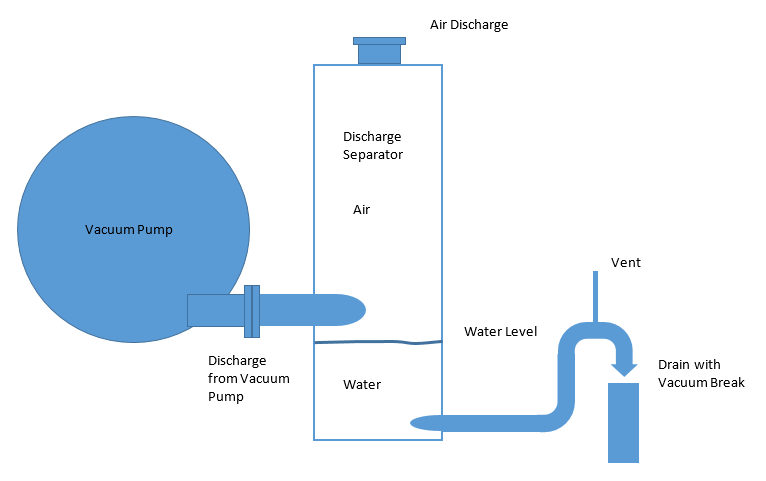 The discharge separator is cylindrical and matched to the vacuum pump. The internal design is beyond the scope of this discussion and portions of that design are proprietary. The bottom of the discharge separator is below the bottom of the discharge pipe coming out of the vacuum pump. The drain out of the discharge separator is tangential to the tank and at the bottom. The drain rises and then falls (this is commonly known as the “goose neck”. The bottom of the goose neck controls the height of the water in the separator so the water is lower than the bottom of the discharge pipe coming out of the vacuum pump. At the top of the goose neck is a vent open to the atmosphere which stops siphoning and also provides a visual indication that the water in the separator is at a height higher than the bottom of the gooseneck. After the gooseneck, the discharge pipe is open to again prohibit siphoning and also to provide a place to visually observe the drain water. The height of the water in the separator must be high enough to provide the pressure to drive the water through the drain. I recently visited an installation that had no goosenecks, vacuum breakers or vents and the drains of multiple vacuum pumps was connected to a common pipe which drained to a pit. I calculated that the pumps would have to have 24 inches of water in the bottom of the separators to drive the water through the drain. This height in the separator would back water up into the vacuum pump by a couple of inches. If there were any upset in the drain the vacuum pump could flood with water (this is the only way to flood a cone ported pump). Flooding the pump will almost invariably result in a failure of the drive (think broken input shaft in the gearbox) or worse yet a broken rotor or pump shaft. We have seen all of these failures. Short of catastrophic failure, I have seen installations where the bottom of the discharge separator is at the height of the discharge of the vacuum pump. In this case, the vacuum pump has to supply the pressure to move the water through the discharge rather than the height of the water pushing it through, and you get to pay in horsepower what should be free. So, if you want to discover if you have an energy-saving opportunity, get a manometer that can measure in inches of water and measure the discharge pressure for the pump. If you find it is pressurized, try to figure out why, or sketch the components and send it to us and we will be happy to give you our opinion based on many years of analyzing these things. Happy Holidays to All from Somarakis!